Converting media files takes time and the use of some software seems more complicated than it seems. 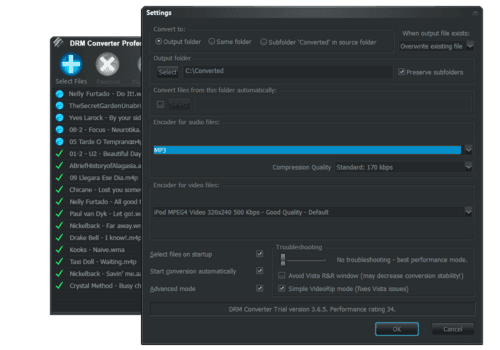 DRM Converter converts protected video and audio files to non-protected ones. DRM Converter can convert media files which can be played from Windows Media Player, Real Player or Quick Time Player. In other words, the application offers a wide range of output including MP3, AAC, M4A, iTunes, iPod, WMA and WAV. The application can also extract the contents of the CD and DVD. When copying, the program keeps the ID3 tags including the name of the artist, album, title, etc. In other words, it makes it possible to copy protected CDs. Apart from conversion, DRM Converter can also remove and replace the file protection. The program has an option to include the reading of the original and the converted. DRM Converter converts files from the following applications: iTunes, Napster, AOL MusicNow, Zune, Yahoo Music, MusicMatch, MSNMusic, Musicload, Rhapsody and MTV. The application is completely free and quick. The interface is intuitive and graphical. Latest update on January 21, 2015 at 08:38 AM.